Power-point used to be the gold standard for presentations. Not anymore. Improving the visual appearance of slides, reducing the amount of text and increasing the number of pictures is not enough. Recent development in mapping software now allow anyone to create presentations that are actually maps and not a sequence of slides. Advantages are obvious (although not necessarily easy to implement): you can easily offer overview and zoom, show how things relate to each other and keep the “big picture”. I already blogged about Prezi, which is making impressive improvements in every new release. More options are available, exploiting the same mapping principle. Ahead is a web based mapping tool, similar to Prezi but with a few more options. Same principle: the basic version is free and your maps are public. If you want more options there’s a monthly subscription. Even their websites is made with Ahead! Timetoast is an interactive tool for creating timelines and roadmaps. As they say in the tag-line “to share the past, or even the future”. Thank you Rahel for the hints! Professor Holenstein just gave an interesting seminar at USI on the cultural differences in the representation of space. He is one of the world major expert on the topic. He is the author of the Atlas of Philosophy (2004). I found interesting to hear his philosophical perspective on a topic I am particularly interested in, which is typically addressed from a mere cognitive point of view. He showed how Japanese people depict their country, with the main axes east-west. while we typically think of Japan as a land that is mainly distributed vertically (north-south) like Italy. He also reflected on how geographical maps cannot be objective depictions of reality but a product of what the cartographer wants to emphasize. Therefore I suppose they can as well be considered knowledge visualization, with a close mapping to the original distribution of information. I found this interesting cartographic knowledge visualization in Jamae mosque in Singapore. In this mosque, located in Chinatown, they make a great use of visualizations for illustrating concepts and information about the Islamic world and religion principles. It is certainly an interesting place to visit to learn more about Islamic religion: they offer pamphlets on several topics and the main praying hall is surrounded by well-crafted illustrations of how Muslim pray, historical background, information on culture, etc. 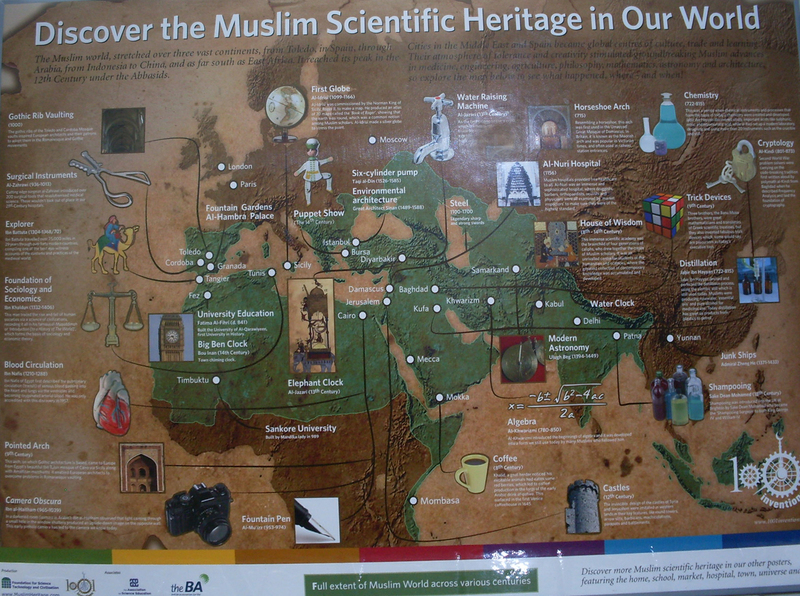 In the image below, a world map is used as a base to highlight the cultural and scientific contributions of Muslims around the world. It is a good example of how to blend pictures and text: images are used both as a mapping background and as explanatory icons.